The St. John’s IceCaps defeated the Portland Pirates 3-1 in Sunday afternoon AHL action at the Mile One Stadium in St. John’s. The win was the IceCaps third straight win at home, a great start to an eight-game at home stand. 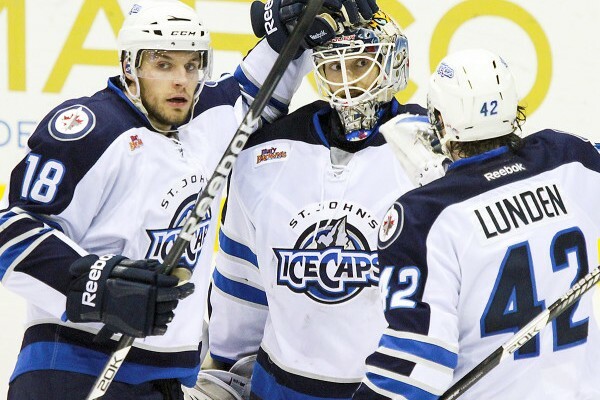 IceCaps goalie Eddie Pasquale stopped 30 of 31 shots to take the win. After a scoreless first period, St. John’s jumped out to a 1-0 lead after Lowry scored on a goal, his forth of the season, assisted by Lipon and Klingberg. The IceCaps carried their 1-0 lead into the third period before Kichton scored his seventh of the season, putting the St. John’s squad up 2-0. Portland responded with a goal by Miele, but St. John’s put the game away when Samson scored the IceCaps third goal of the game unassisted.